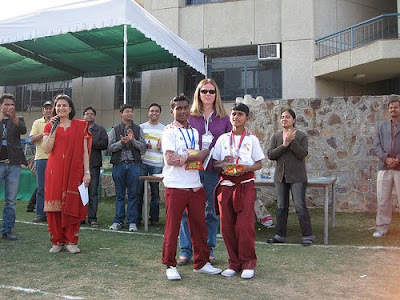 One of the happiest places in Delhi yesterday had to be at Concern India’s Sports day in Gurgoan. 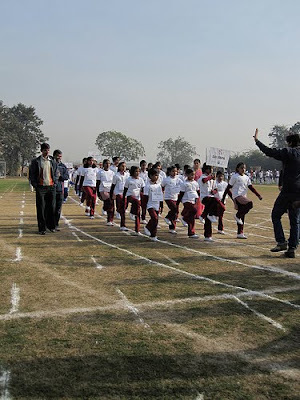 Seventeen different NGOs fielded teams of 20 children, from age 6 to 14 in a day long Track and Field event. More than 340 children had the time of their lives, and scores of volunteers, teachers, project leaders and sponsors felt like children again. I was there with my son Kelly, family friend Gabe, and 8 of the most dedicated and enthusiastic supporters from Cornell Overseas that you could imagine! 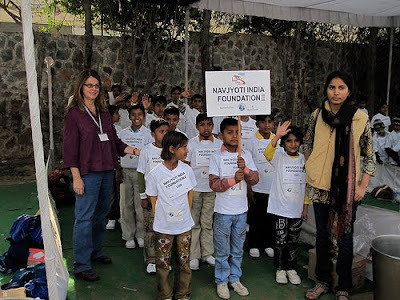 The Giving World was a sponsor through Concern India of two fabulous teams of children. Sai Kripa – a school of mostly first generation learners outside of New Delhi and Navjyoti, a street school project in Delhi. We cheered on our teams, heralded our winners and high fived everybody else in sight. The day was professionally organized in a large field, with a marked track – we had elimination rounds, semi finals and finals. We had shot put and 100 yard dash, leap frog and three legged races, inventive skipping races, relay teams and a cardboard race that has to be seen to be understood! There was the spoon with lemon race, and the sack race too- in short something for all age groups and athletes to excel in. 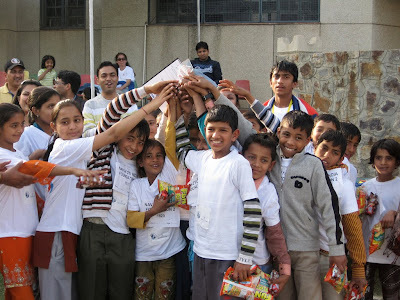 The day is organized as a give back to underprivileged children of a variety of Delhi projects. And designed to allow them to step into the exciting world of sports and spectators. There are trophies, ribbons and certificates for all attendees. There was a winner’s podium for first second and third place. There was a March past that was a happy organized and inspiring kick off to the day. Breakfast and lunch were served by the volunteers complete with a Tiffin box to take away. All of the children received a fresh souvenir tee-shirt and a new pair of white running shoes. By the afternoon many had discarded their shoes in an effort to be the fleetest of foot. Competition was high, and so was good humor. I had to constantly pinch myself to feel that this was a real day and not a dream. The sun shone on us and we all left with a little sunburn, a lot of smiles and memories for a lifetime- children and grown children alike. 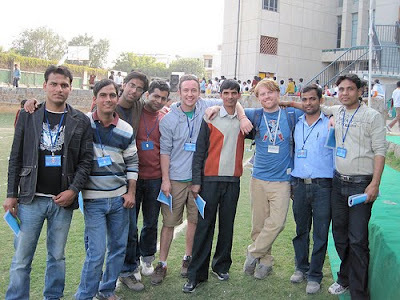 I have to thank my lucky stars that through the Giving World Foundation and Concern India I can work with such a tremendous group of people and have the privilege of participating in these awesome events. Life is it’s own reward. I like to get up early and watch the sunrise. The colors change from blue gray, the purples to corals to pinks, to yellows. Each day the colors are a little different, and I marvel at it all.